Run Time: 144 min, Rated PG (Canada), Rated PG-13 (MPAA) for extended sequences of intense fantasy action violence, and frightening images. Peter Jackson's The Hobbit: The Battle of The Five Armies concludes his film adaption of J.R.R Tolkien's novel The Hobbit (1937), or at least begins its conclusion since an extended edition will come out in about a year. These releases contain scenes with new dialogue and information and—especially in the case of the Hobbit films—fill in important plot details that provide additional character motivations. They can even tie up loose ends in the general narrative. For viewers of the extended editions of The Hobbit: An Unexpected Journey (2012) and The Hobbit: The Desolation of Smaug(2013) the theatrical release of Jackson's final film The Hobbit: The Battle of the Five Armieswill feel like about 80 percent of a movie. Keen viewers can expect the remaining 20 percent of the newest filmlate in 2015 when it's released on Blu-ray, DVD, and digital download formats. In the prologue of the first film Jackson painted an epic depiction of the Dragon Smaug stealing away from the Dwarves the mountain kingdom and its gold riches. 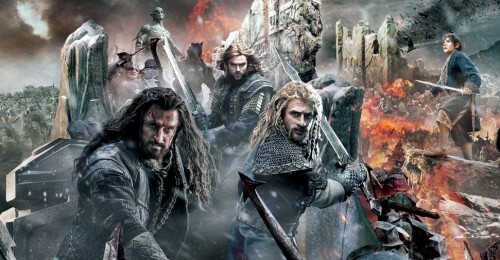 As this last film gets rolling the Dwarves, led by Thorin Oakensheild (Richard Armitage),and his company which includes Bilbo Baggins (Martin Freeman), have achieved what they set out to accomplish in the first film: gain back the Lonely Mountain and its gold. But for Thorin, having the Mountain isn't enough; he also desires the very heart of the mountain—the Arkenstone. The Arkenstone and the vast gold treasures of the mountain are polluted with the avarice and evil of Smaug which infect Thorin with "dragon sickness," an extreme combination of greed, coveting, and paranoia which impairs a person's ability to think wisely. Sadly, director Jackson doesn’t depict Thorin's transformation from the heroic “King Under the Mountain” to a psychotic lunatic very well and it feels rushed and underdeveloped. Thorin’s fall from hero is so instantaneous that it undercuts his eventual moment of redemption. 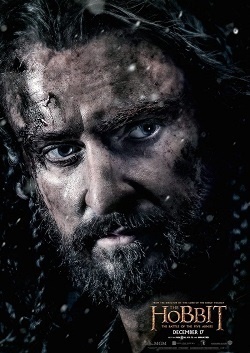 Will a more nuanced rendition of Thorin's corruption be presented in an extended edition of the film? Perhaps. And this is the type of question keen viewers will ask over and over. More casual viewers may not be too concerned with some of the plot holes and missing information in part because Jackson has managed to make a rather fast-paced film. Being the last film inThe Hobbittrilogy there was a general expectation that Jackson would do three things: 1) bridge the two film trilogies Lord of the Rings and The Hobbit; 2) conclude the Hobbit trilogy; 3) make a stand-alone film. 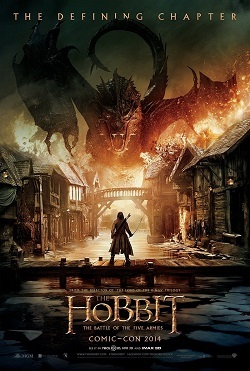 When viewed from the vantage point of a six-film telling of Tolkien's stories this last Hobbit film, while entertaining, doesn't excel in bridging the two trilogies and it likewise doesn't stand well on its own mostly because it lacks a distinctive beginning, middle and end. More so than any of the other films this final film feels like a string of serialized events. When compared to the final film in the Lord of the Rings trilogy, The Return of the King(2003), Jackson's final Hobbit film doesn't tie up the Hobbit trilogy’s loose ends as effectively or conclude the storyline with the same emotional impact. The new film also downplays the ring carried by Bilbo in the first films (and then by his nephew Frodo in the Lord of The Rings trilogy)—that little, unassuming, golden ring of invisibility that will be revealed to be Sauron's evil ring of power. The ring is the reason for telling the Hobbit story as a prequel and is the common thread weaving together the two stories. In the previous two Hobbit films Jackson advanced the plot of the ring and its impact on the story as a whole. However, in The Hobbit: The Battle of The Five Armieshe does little to move this part of the story forward. He spends no time investigating the nature of the ring and its growing hold over Bilbo nor its ability to draw a person into coveting the ring above all other things. 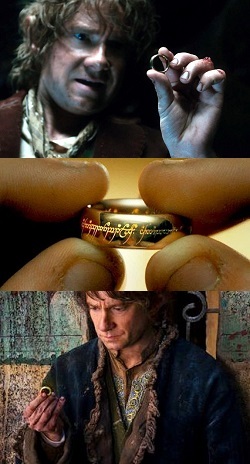 The ring was never put in any peril and there was never a moment when any character was tempted to desire the ring for themselves or try to steal it from Bilbo. Amidst the enormous number of CGI warriors duking it out at the foot of the mountain, the trilogy’s over-arching cautionary theme of the dangers of coveting and of greed's effects on others is, for the most part, lost in the clang of swords and shields. That being said, is there any of that theme that's retrievable from the battlefield of Jackson's film? At first the bowman Bard (Luke Evans) and the Men of Lake-Town (a city in ruins) look to the Mountain for protection and its Dwarf halls for shelter from the coming cold of winter. Some of them look to have the gold, but Bard is depicted as wanting the best for his family above everything. In the book Bard’s character would be happy to have his share of the gold for having killed the Dragon Smaug. However, Jackson has made his Bard more noble and less grim. By the end of the film the Men are fighting for their lives and ultimately fighting to help Thorin keep his house and inheritance. In the theatrical release of The Hobbit: The Battle of The Five Armies Thrandual (Lee Pace), the king of the Elves of Mirkwood, has rather vague reasons for wanting to take what belongs to Thorin. His interests seem focused on some white gems which Thrandual refers to as heirlooms. These gems include a piece of jewellery which look to be fashioned into a woman's headdress and they are presented as the catalyst for the antipathy between the Erebor Dwarves and the Elves of Mirkwood. This current film hints that the gems may be connected to Thrandual's dead wife, perhaps the jewelled headdress was hers or was intended for her. In the extended version of The Hobbit: An Unexpected Journey Jackson provided some explanation showing how these gems along with the jewelled headdress were withheld from Thrandual by Thorin's grandfather Thror. Essentially by developing this back story Jackson has made his Thrandual more complex than the Elven king of Tolkien's book. By the end of the film Thrandual and his Elves, along with the Men, ultimately, if reluctantly, are fighting to help Thorin keep his house and inheritance. The Orc/Goblin armies led by Azog (Manu Bennett) and his son Bolg have a well-established genocidal hatred for the Dwarves but their interest in taking the Lonely Mountain from Thorin is guided by a greater evil: Sauron, the villain of The Lord of the Rings films and forger of the ring Bilbo carries, apparently covets the Mountain as a strategic staging point for establishing a base of operations for a future war against all the peoples of Middle Earth. At no point do Azog, Bolg or their minions ever end up helping Thorin keep his house and inheritance. They, with Sauron, are relentless in their greed and desire for what belongs to Thorin and the Dwarves. So whether their reasons for coveting what belongs to Thorin appear as noble, petty, or callous, they all covet Thorin's house and at one point or another are found scheming to get their neighbour's inheritance with words and/or by force. The one exception is the Great Eagles and the Woodland creatures who swoop in to the rescue. They make no claim on the Lonely Mountain or its wealth and alone seem to be helping Thorin keep his house and inheritance for reasons unpolluted by greed. They are summoned by Gandalf (Ian McKellen)whose only desire is to keep the house and inheritance of Thorin out of the hands of the evil Orc/Goblin armies and their overlords. What complicates the whole matter is the fact that when Thorin finally achieves his goal and gains the wealth of the mountain he is not generous with it. He doesn't use his great wealth to right wrongs and to help his neighbour in need. Thorin, while going back on his word, shows a distinct lack of integrity: He holds grudges for past wrongs and is a poor picture of a heroic leader. In no way does he come off as an innocent individual being taken advantage of; he's as guilty of greed as the next person in the story. Viewers then may well ask: “Is a person obligated to help their neighbour keep his house and inheritance even if their neighbour is a jerk and looks to be undeserving of what is his?” The Christian answer is yes. Does Jackson's film drive home the role of grace inherent in helping someone keep what's theirs even if they've become a terrible person? Not as eloquently as would be expected when compared to other films in this series. For avid fans of the book one of the most anticipated moments in the film is when Bilbo and Thorin reconcile. The two friends have a major falling out when Bilbo, who has the Arkenstone all along, gives it to the Men and Elves rather than to Thorin. To Thorin this looks like a betrayal, but in reality Bilbo is trying to spare Thorin's life and those of the other Dwarves with whom Bilbo had originally set out. This reconciliation is one of the clear spots where the theme of contentment versus discontent is addressed and, in the book, is a powerful moment of forgiveness between two friends. The moment portrayed in the film is not as powerful. However, in the film Thorin does say to Bilbo, "Farewell, Master Burglar. Go back to your books, your fireplace. Plant your trees, watch them grow. If more of us valued home above gold, it would be a merrier world." The last sentence contains the moral of the whole story and is Thorin's word of repentance in the face of the sin of coveting and every temptation that leads to greed and discontent. Under the CGI, makeup, and fantasy of Jackson's film we find the Christian encouragement to be content with home and be a defender of the House and inheritance of others, and this is a good thing. Jackson's filming of J.R.R. Tolkien's The Hobbit and The Lord of The Ring's books has always been a difficult and ambitious endeavour. As a series of adaptations they have met with mixed responses over the years. Some of the films are better than others and as enjoyable as the theatrical release of The Hobbit: The Battle of The Five Armies is, it isn't the best of the films. What it will end up being in its, presumably, final extended edition remains to be seen. For those who love the fantasy genre of filmmaking there is a lot to love in Jackson's final Hobbit film and there are a couple eye-rolling moments too. It's recommended that viewers planning to see The Hobbit: The Battle of The Five Armies watch the previous films first or they may get lost in the middle of the action.